The NIU Chemistry Club invites the public to its spring 2018 Chemistry Demo Night at 6:30 p.m. Friday, March 30, in the Carl Sandburg Auditorium of the Holmes Student Center. The theme will be “Chem-Olympics,” in honor of the recent Winter Olympics, and the free event will feature chemistry with colorful reactions and effects. Doors open at 6 p.m. The annual event typically draws a large audience. This semester’s demonstrations include ping-pong-ball explosions, melting Styrofoam, pressure imploding cans, a liquid nitrogen plume, “elephant toothpaste” and a model car powered by baking soda and vinegar. 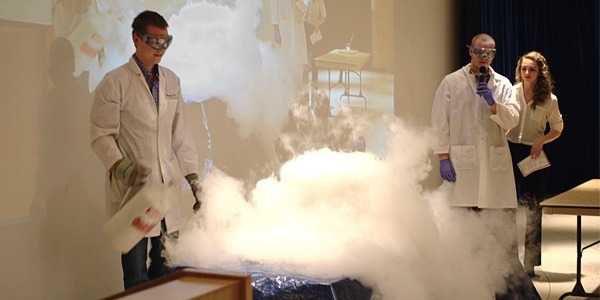 The evening also will feature a Chem Club specialty – liquid nitrogen ice cream. Faculty advisers helping with this semester’s demo preparations include Oliver Hofstetter, Timothy Hagen, Narayan Hosmane, Lee Sunderlin and Chong Zheng. The experiments for the evening will include bright flashes of light, fire and heat, and intermittent periods of low light and/or darkness. For safety precautions, members of the audience are prohibited from siting in the auditorium’s first two rows. Parking will be available in the NIU Parking Deck along the west side of Normal Road, about one block north of Lincoln Highway (Route 38), or in the nearby visitor lot on Carroll Avenue, just west of the parking garage. For more information, contact Alexander Miller at z1715195@students.niu.edu.